While most companies are moving, or have already moved, into the social media space it is a new venture for most companies as well as their employees. The benefits of social media have been well publicized so I won’t go into them here, but what have not been well publicized are the risks of using social media for individuals. And to be clear, I’m not talking about the risks of your personal information being stolen or the Evil H4ck3rZ getting into your Facebook account. What I’m talking about are the sometimes stupid and ill-formed decisions we make about exactly what we are posting. In June I spoke at the Gartner Risk & Compliance Summit in Washington DC, and while there I saw a presentation by Marne Gordon from IBM on Social Media policies that I thought was an excellent overview of exactly why having a social media policy is important. Not having the 30 page editorial space to recap the entire presentation, I’ve pulled out a few examples that I think best demonstrate exactly how we can sometimes really make a mess of things when we don’t consider what our actions will lead to. There are a couple interesting things here that are worth commenting on. First of all, the fact that Brittany posted the comments she did while knowing (or forgetting) that her boss had access to read them was just plain dumb. However, the really interesting thing is not what she said, but what her boss Steve said. In most countries, and I’m assuming the country they are in is England based on the comment of sending the P45 form (which is an employee termination form in the UK and Ireland), you can’t disclose why you are terminating an employee. What Steve did was essentially fire her over Facebook which isn’t the most professional avenue nor is it an appropriate legal forum for such an action. There is a ton of employment law in the UK, and in essence, Brittany may have some legal recourse for Steve’s actions. Lesson to learn: Don’t forget who can read your posts and never post a retaliatory comment. Keep it private! 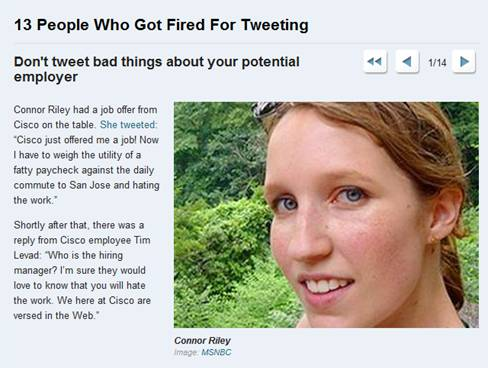 Another good example is the case of Connor Riley who was offered a job at Cisco then tweeted about her lack of enthusiasm for it. 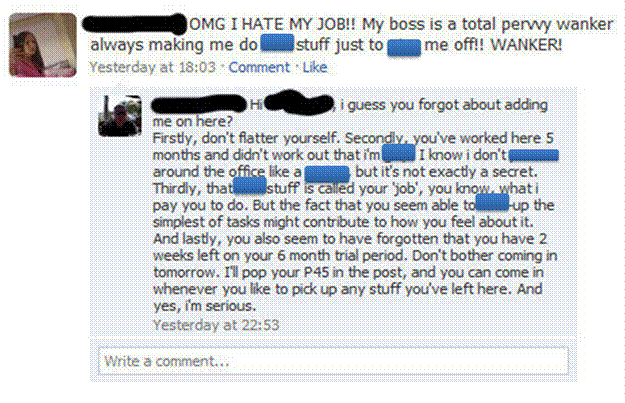 In this instance she was confronted by another Cisco employee who passed her comments on to her hiring manager. The job offer was rescinded as a result of her tweet. Lesson to learn: The things you say online can return to haunt you in the real world! It’s the Future I tell you! 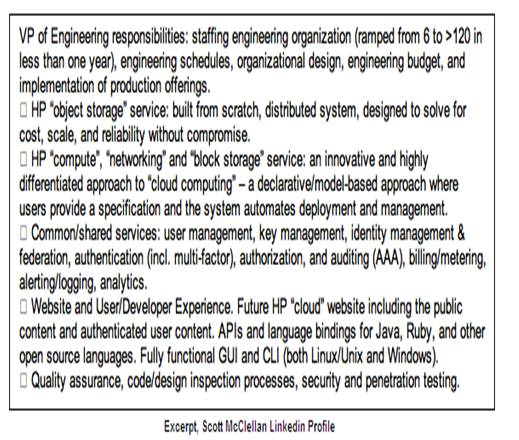 A third example is the story of an HP VP, Scott McClellan who accidentally divulged a secret project HP was working on in the cloud computing space by posting an updated resume on his LinkedIn profile. 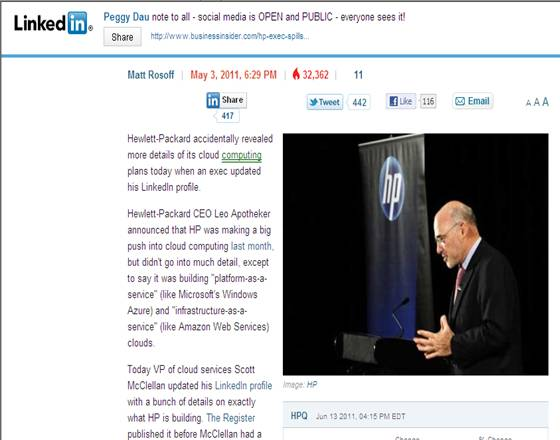 While seemingly innocuous, by doing so he divulged details that HP was striving to keep secret to protect its market position in the cloud computing space. In this instance, it’s safe to say Scott’s post caused a major embarrassment for himself as well as possibly derailing his career with HP, and quite possibly, future employers. Lesson to learn: Be careful what you are posting as it can lead to other unintended consequences. Never post anything that isn’t considered to be public knowledge! Now that we’ve seen three examples of things not to do, how do we avoid a similar fate? The answer is to ask yourself the following questions prior to making any post in a public forum. Am I a corporate spokesperson and am I allowed to post this company information? Is the information confidential or could it be considered so? Have I identified supervisors or co-workers by name? Are my remarks slanderous or libelous? If someone reads this what is the worst thing that can happen? What if it’s read in 5 years by a new boyfriend, girlfriend, employer, or prospective customer? Am I portraying myself as I want others to view me? Am I speaking for myself or my employer? Along the same lines, have I identified myself as an employee of the company? Have I clearly identified that these are my personal opinions? It is highly recommended to maintain separate business and personal accounts. Identify your personal accounts as such like the example below. Living and working in the world today means we will almost always be exposed to different forms of social media. While social media does have good uses, how we use that technology is up to us. And the more we use it the more of “us” is being put out on the internet for others to read. The internet has a very good memory and inevitably the things we write online can come back to bite us in the future. As social media evolves and we use more of it, there is one thing we all need to keep in mind – just because you can post, does not mean you should post!